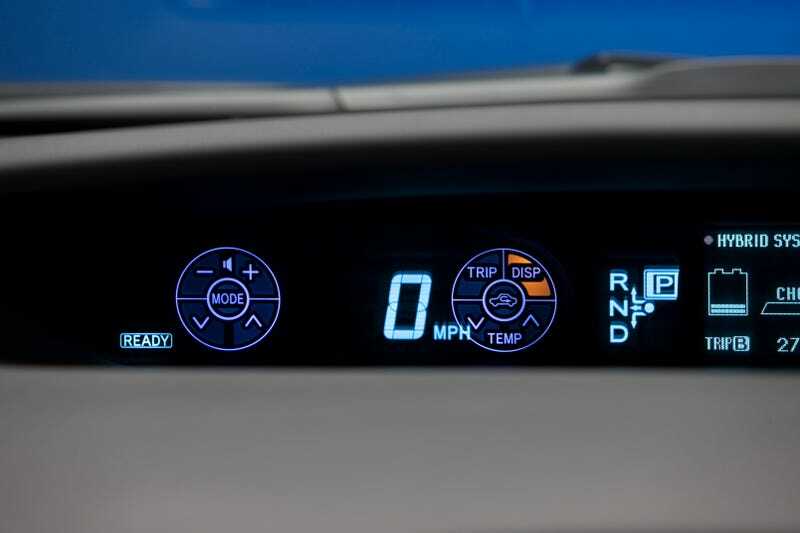 The 2010 Toyota Prius uses a clever display that mimics user inputs on steering wheel-mounted buttons in the information display meaning you can keep your eyes on the road and not on the buttons. Although we'll have more on this intuitive system when we're allowed to run our embargoed drive of the new Prius, we figured we'd give you an early taste. It's one of those things that's incredibly simple, yet incredible effective. The two round steering wheel-mounted button clusters are repeated in the information display. That display is mounted at the top of the vehicle's dash, with a focal range approximate to that needed for viewing the road. As you push one of the buttons, the two circles appear in the display and the button you push is highlighted in orange - a visual feedback that confirms your selections. The steering wheel controls include: audio functions, climate control, trip computer, dynamic radar cruise control, telephone, and lane keep assist. In short, most of the secondary functions you'll commonly use while driving.